Greggs is a north east institution. From a small bakery in Newcastle in the 1930s and delivery via bicycle it is now all over Britain. Coffee, sandwiches and the famous stottie cake. Greggs history has been about adapting to change and you can now get a Greggs app for your smart phone to pay in-store and collect some rewards. What about going really out on the edge and buying Greggs with Bitcoin. A few years back I picked up a few Satoshi* just to see how Bitcoin worked. For me it was a computer science experiment rather than a serious financial transaction. You can see (above) just how small a Satoshi is and my lack of an actual single Bitcoin puts me at the bottom of the Bitcoin millionaire scale. However if I read the casual comments of the Internet it seems that Bitcoin users only want Bitcoin to buy drugs. I suspect cash is much easier for that task but let me play along with the myth. I wanted to know if I could buy a Greggs steak bake and a coffee with Bitcoin. Surprisingly it turns out you can! 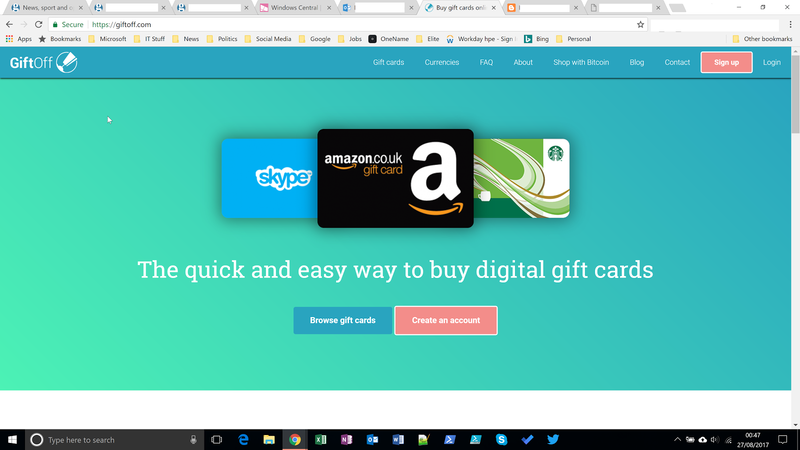 I found Giftoff - a website you can exchange Bitcoin for gift cards. With your gift card you can buy a steak bake and coffee. So I bought a Greggs gift card. What you get is a code that is basically the same as the Greggs app generates. When you want to pay just ask the cashier to tap in the code as if it's on the app and you get your steak bake. Now with the rising price of Bitcoin it looks like lunch is now paid for a few weeks. Having said this the activity is pretty pointless for normal people because money works just as well. However as a bit of fun with digital cash the temptation to try and buy at Greggs was a challenge I had to try. Amazon is great. I have been shopping with them since 1998 when you could only buy books and CDs. Today you can buy almost anything. Over time the idea of delivery has changed. Amazon is online so they also deliver services online. Movies, TV, music and probably a few other things I haven’t spotted. However I just buy stuff occasionally. It does bother me that Amazon is the creator of zero hours contract low wage jobs but its really hard to avoid the low wage low cost economy. Amazon have been doing Amazon Prime for a while now. If you are not a regular user of Amazon you may not be aware of this premium service where you can get free delivery, next day delivery, movies, tv and music for a yearly fee of about £79. They also throw in some exclusive offers, discount days and almost anything that gets customers into the store. I have no problem with this subscription model and that it has made Amazon founder Jeff Bezos a load of money. Briefly, as the Amazon share price went up on 27th July 2017, he became the world’s richest man. So business is good. Many people find the Amazon Prime service great value and love all the bundled offers. I don’t. I like Netflix, Spotify and mixing up my online purchases. What I don’t like is being cursed by Amazon Prime. Most times I just want to buy something, get it delivered with free postage and I don’t care if it takes 5 working days to get to me. I don’t even care if I have to collect it next week from a locker or some other place. Prime now haunts me during the buying process. Without huge care you click the button for your free 30 day trial. By which they mean we hope you forget and we swipe money out of your credit card every month 30 days from now. The curse is that we have been seduced by one click shopping. The continue button always just completes the purchase – right? Nothing sinister there? Not on Amazon. Those large buttons in the final page offering free next day delivery are really now a passive sign up to Amazon Prime. I now have to double and triple check every option before buying anything just in case I get signed up for Prime, or drone delivery, or maybe (at some future stage) rocket launched orbital delivery. After all Bezos seems to want to go to Mars! A few days ago they caught me again. It’s been a couple of years since I last unwittingly signed up for one month of Prime trial. Then it’s happened again. I have one month of free Amazon Prime again! I immediately switch it off because I don’t want to forget and then have them raid my account in 30 days. Switching it off involves going to a buried menu in “Your Account – Manage Prime Benefits”. They don’t just have an off button to undo the very big “Continue” button that signs you into the service you don’t want. With all big successful companies there is a moment when they think they are so wonderful you will want to send them money all the time. Amazon has reached that stage. I call it the curse of Amazon Prime.